Local health and social service groups and officials. 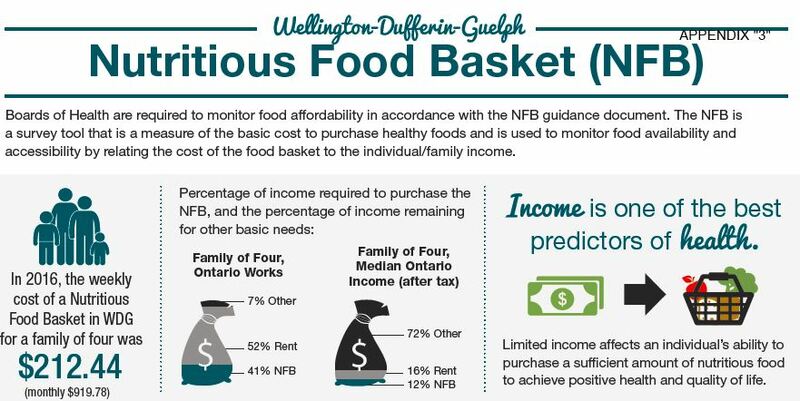 ​This report provides information on the cost of a Nutritious Food Basket (NFB) in Wellington, Dufferin and Guelph (WDG) for 2016. The NFB is a tool that estimates the basic cost for an individual or household to eat healthy. Data from the NFB costing is used by Wellington-Dufferin-Guelph Public Health (WDGPH) for program planning and to promote access to healthy, nutritious food. In 2016, the cost of the NFB in WDG for a reference family (a man and woman each aged 31 to 50 years; a boy, 14 to 18 years of age; and a girl, four to eight years old) is $212.44 per week. In 2016, food costs increased 1% since 2015. Local data shows that since 2009 when the new nutritious food basket protocol was implemented, there has been a 27% increase in the cost of food over a 7 year period. The results of this report clearly show that individuals and families with low incomesa do not have enough money to pay for their basic needs including shelter and healthy food (Appendix 1). Food insecurity is a serious public health concern because of its relationship with poor nutrition and negative physical and mental health effects among both adults and children. Improved incomes are the most important response to food insecurity. Having economic and physical access to healthy food is vital to eating well, which in turn, plays a major role in an individual’s health at any stage of life. The findings of this report highlight the need to educate the public on the root issue of food insecurity and for public health to continue to work with community partners to advocate for adequate incomes for families and individuals that allow them to buy nutritious food. The NFB survey was conducted in May 2016 by a WDGPH Public Health Nutritionist. Food pricing in seven grocery stores including chain and independent stores across WDG was assessed as instructed in the updated Protocol. Case scenarios were created to compare income and expenses for the purchase of food and rental housing for families and individuals in a variety of settings (Appendix 1). The cost of housing is the largest expense for most low income residents. Housing is considered affordable if it costs less than 30% of household income.14 Six out of the seven scenarios in Appendix 1 demonstrate that the percentage of income spent on rent is much higher than 30%. In fact these six scenarios show a range of 39-92% of income being spent on rent alone. The single person on Ontario Works (OW) fares the worst as 92% of their income may go to rent leaving insufficient money (8% of income) left over to purchase food and cover other basic expenses. Caution needs to be taken when comparing years as the number of member agencies of the OAFB can vary year to year. There are 38 agencies providing some type of emergency food service within our region and many of them are not members of the OAFB.19 This makes it difficult to document an accurate picture of emergency food service trends and statistics. The measurement and monitoring of food insecurity in Canada focuses on a household’s experience of inadequate or insecure access to adequate food due to financial constraints.20 Food insecurity can be measured at marginal, moderate, and severe levels. Food insecurity is a major public health issue as there are numerous impacts on physical, mental and social health associated with being food insecure. Families with lower incomesc are at a higher risk of being food insecure because the root issue is poverty. Charitable food programs has been the traditional response to this issue but these support services do not address the root issue of insignificant income to afford food. Solutions must be income focused. Public Health can be a credible advocate for the most important response to food insecurity and advocate for income based solutions and help ensure that all households in WDG avoid being food insecure by having enough financial resources to purchase food. The findings presented in this report highlight the need for Public Health to continue to work collaboratively with local and provincial advocacy groups such as the Guelph and Wellington Task Force for Poverty Elimination (Poverty Task Force), the Ontario Society of Nutrition Professionals in Public Health’s Food Security Work Group and Headwaters Food and Farming Alliance (Appendix 3). c For the purposes of this report “lower incomes” refers to the case scenario spreadsheet appendix 1 in which households spend a significantly higher proportion of their income on shelter and food compared to average Ontario family income. CD #1. The board of health shall conduct epidemiological analysis of surveillance data, including monitoring of trends over time, emerging trends, and priority populations, in accordance with the Population Health Assessment and Surveillance Protocol, 2008 (or as current), in the areas of healthy eating. CD #2. The board of health shall monitor food affordability in accordance with the Nutritious Food Basket Protocol, 2008 (or as current) and the Population Health Assessment and Surveillance Protocol, 2008 (or as current). CD #7. The board of health shall increase the capacity of community partners to coordinate and develop regional/local programs and services related to healthy eating, including communitybased food activities. CD #11: The BOH shall increase public awareness in the area of healthy eating. CD #12. The board of health shall provide advice and information to link people to community programs and services in the area of healthy eating. 5. Kirkpatrick S. Food insecurity is associated with nutrient inadequacies among Canadian adults and adolescents. J Nutr. 2010;138:604-612. 7. Eicher-Miller H, Mason A, Weaver C, McCabe G, Boushey C. Food insecurity is associated with diet and bone mass disparities in early adolescent males but not females in the United States. J Nutr. 2011;141(9):1738-1745.
provinces. Soc Psychiatr Epidemiol. 2015; 60(6):963-972. 11. Bronte-Tinkew J, Zaslow M, Capps R, Horowitz A, McNamara M. Food insecurity works through depression, parenting, and infant feeding to influence overweight and health in toddlers. J Nutr. 2007;137(9):2160-2165. 12. Jyoti D, Frongillo E, Jones S. Food insecurity affects school children’s academic performance, weight gain, and social skills. J Nutr. 2005;135:2831-2839. 14. Canadian Mortgage and Housing Corporation. About affordable housing in Canada | CMHC [Internet]. 2015 [cited 17 July 2015]. Available from: http://www.cmhcschl. 15. Sabatini, R. Request for stats [Internet]. Message to: Lisa Needham 2016 April 26. [cited 2016 July 22]. 16. Krepps K. Resquest for stats [Internet]. Message to: Lisa Needham 2016 April 26. [cited 2016 July 22]. 17. Handler D. 2008-2012 OW caseload, Dufferin Count [Internet]. Message to: Lisa Needham 2012 July 30. [cited 2015 July 21]. 18. Larose, A. FW: 2015 Data by Food Banks [Internet]. Message to: Lisa Needham 2016 March 17. [cited 2016 August 26]. 19. Guelph & Wellington Task Force for Poverty Elimination. Guelph-Wellington-Dufferin food access guide [Internet]. 2013. [cited 13 August 2015] Available from: http://gwpoverty.ca/wpcontent/uploads/2013/12/Food-Access-Guide-2013-Upd…. 21. Kirkpatrick S, Tarasuk V. Adequacy of food spending is related to housing expenditures among lower-income Canadian Households. Public Health Nutr. 2007;10(12):1664-1473. 22. Kirkpatrick S, Tarasuk V. Assessing the relevance of neighbourhood characteristics to the household food security of low-income families. Public Health Nutr. 2010;13(7):1139-1148. 23. Vozoris N, Tarasuk V. Household food insufficiency is associated with poorer health. J Nutr. 2003;133:120-126. 24. Kerstetter S, Goldber M. A review of policy options for increasing food security and income security in British Columbia: A discussion paper. 2007. 25. Monsivais P, Drewnowski A. The rising cost of low-energy density foods. J Am Diet Assoc. 2007;107:2071-2076. Note: All dollars rounded to nearest whole number. Scenario 1 - 2 adults (male and female ages 31-50), 2 children (girl age 8, boy age 14); Ontario Works (OW). Scenario 2 - 2 adults (male and female ages 31-50), 2 children (girl age 8, boy age 14); income is based on one minimum wage earner, 40hr/wk, $11.25/hr (minimum wage in May 2016). Scenario 3 - 2 adults (male and female ages 31-50), 2 children (girl age 8, boy age 14). families with children, two earners. Assumption of a dual income family with a split of 65% / 35% between partners. Scenario 4 - 1 adult (female age 31-50), 2 children (girl age 8, boy age 14); Ontario Works. Scenario 5 - 1 adult (male age 31-50); Ontario Works. Scenario 6 - 1 adult (male age 31-50); Ontario Disability Support Program (ODSP). Scenario 7 - 1 adult (female age 70+); income based on Old Age Security and Guaranteed Income Supplement (OAS/GIS). a- Due to the Northern Ontario Energy Credit portion of the Ontario Trillium Benefit (OTB), this worksheet is applicable for Ontario excluding the districts of Algoma, Cochrane, Kenora, Manitoulin, Nipissing, Parry Sound, Rainy River, Sudbury (including the City of Greater Sudbury), Thunder Bay, and Timiskaming. b - Basic and maximum shelter allowance. OW rates effective November, 2015 and Ontario Disability Support Payment (ODSP) rates effective October, 2015. Source: Social Assistance, Pension and Tax Credit Rates April to June 2016, Ministry of Community and Social Services. http://www.communitylegalcentre.ca/legal_information/Tips/IM/SA-pension-… (accessedJuly 25, 2016). c - Old Age Security and Guaranteed Income Supplement (OAS/GIS) rates. Source: Social Assistance, Pension and Tax Credit Rates April to June 2016, Ministry of Community and Social Services. http://www.communitylegalcentre.ca/legal_information/Tips/IM/SA-pension-… (accessed July 25, 2016). d - Ontario Guaranteed Annual Income System (GAINS) rates. Source: Social Assistance, Pension and Tax Credit Rates April to June 2016, Ministry of Community and Social Services. http://www.communitylegalcentre.ca/legal_information/Tips/IM/SA-pension-… (accessed July 25, 2016). e - Canada Child Tax Benefit (CCTB) includes Basic monthly amount, National Child Benefit Supplement monthly amount, and Ontario Child Benefit monthly amount. Effective July 2014 to June 2015. http://www.cra-arc.gc.ca/bnfts/menu-eng.html (accessed September 13, 2016). f - Based on net annual income. GST/HST is issued on a quarterly basis, but calculated on a monthly basis. Figures derived from GST/HST and related provincial programs calculator. Effective July 2014 to June 2015. http://www.cra-arc.gc.ca/bnfts/menu-eng.html (accessed September 13, 2016). g - Ontario Trillium Benefit (OTB) includes Ontario Energy and Property Tax Credit, the Northern Ontario Energy Credit, and Ontario Sales Tax Credit. Based on average apartment rental rates for Ontario (see k) and net annual income. Ontario Trillium Benefit is issued on a monthly basis. Figures derived from Ontario Trillium Benefit and related provincial programs calculator. Effective July 2014 to June 2015. http://www.cra-arc.gc.ca/bnfts/menu-eng.html (accessed September 13, 2016). h - Reference: Working Income Tax Benefit Online Calculator . http://www.cra-arc.gc.ca/bnfts/menu-eng.html (accessed July 25, 2016). i - Reference: Employment Insurance Premium Rates.http://www.cra-arc.gc.ca/bnfts/menu-eng.html (accessed July 25, 2016). j - Reference: Canada Pension Plan. http://www.cra-arc.gc.ca/bnfts/menu-eng.html (accessed July 25, 2016). k - Rental costs calculations are from the Rental Market Report: Ontario Highlights. Canada Mortgage and Housing Corporation, Fall 2015. Some communities may need to add utility costs. https://www03.cmhc-schl.gc.ca/catalog/productDetail.cfm?lang=en&cat=102&… (accessed July 22, 2016). 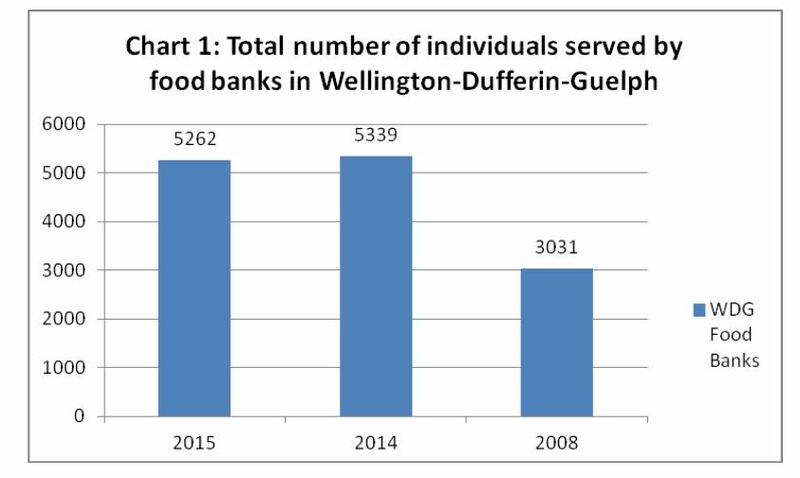 l - Reference: Nutritious Food Basket Data Results 2016 for Wellington-Dufferin-Guelph Public Health - Includes Family size adjustment factors. m - Reference: Minimum wage. http://www.labour.gov.on.ca/english/es/pubs/guide/minwage.php (accessed July 29, 2015). n - Source: Statistics Canada. Average income after tax by economic family types (2007 to 2011). http://www.statcan.gc.ca/tables-tableaux/sum-som/l01/cst01/famil21a-eng.htm (accessed July 25, 2016). o- Housing for Scenario 6 was changed from a Bachelor apartment in 2010 to 1-bedroom in 2011. This change reflects a more accurate housing need for persons with a disability. This change will need to be recognized when attempting to compare year over year results. For information purposes and internal use only. In 2016, an average family of four, (a man and woman each aged 31 to 50 years; a boy, 14 to 18 years of age; and a girl, four to eight year old) living in WDG needs $212.44 a week to buy the quantity of basic foods in the NFB, to meet minimum nutrition recommendations. In 2016, the WDG NFB costs have increased 1% since 2015. From 2009 until 2016 the nutritious food basket for a reference family of four has increased 26%. The cost of housing is the largest expense for most low income residents. Housing is considered affordable if it costs less than 30% of household income.3 All of the scenarios (6 out of 7) that rely on social assistance or minimum wage jobs for income in Appendix 1 demonstrate that the percentage of income spent on rent is much higher than 30%. In fact these six scenarios show a range of 39-92% of income being spent on rent alone. The average monthly rental cost for a three-bedroom apartment in Guelph, was $1160 in fall 2015 yet the maximum monthly shelter allowance for OW is only $718.00 for a family of four.4,5 This example demonstrates a potential shortfall of $442 for shelter allowance. 2. Statistics Canada. Consumer Price Index, by province (monthly) (Canada) [Internet]. 2016 [cited 22 July 2016]. Available from: http://www.statcan.gc.ca/tables-tableaux/sum-som/l01/cst01/cpis08aeng. 4. Canadian Mortgage and Housing Corporation. Housing market information portal [Internet]. 2016 [cited 22 July 2016]. Available from: https://www03.cmhcschl. 5. Ministry of Community and Social Services. Social Assistance, Pension and Tax Credits. 2016. 6. Food Banks Canada. Hunger count 2015 [Internet]. 2016. [cited 29 June 2016] Available from: http://www.foodbankscanada.ca/HungerCount. 8. Larose, A. FW: 2015 Data by Food Banks [Internet]. Message to: Lisa Needham 2016 March 17. [cited 2016 August 26]. 10. Marchesich T. Request for statistics [Internet]. E-mail to: Lisa Needham. 2015 June 17 [cited 2015 July 20]. 11. Jonker C. Request for stats for Concern Food Bank [Internet]. Message to: Lisa Needham. 2016 April 26 [cited 2016 June 29]. 12. Krepps K. Resquest for stats [Internet]. Message to: Lisa Needham 2016 April 26. [cited 2016 July 22]. 15. McIntyre L, Bartoo A, Herbert Emery J. When working is not enough: food insecurity in the Canadian labour force. Public Health Nutr. 2012;17:49-57. 17. Tarasuk V, Dachner N, Loopstra R. Food banks, welfare and food insecurity in Canada. Brit Food J. 2014;116(9): 1405-1417.